Members receive six A4 size colour magazine each year. This contains Club meetings and events, technical information and advice, topics of general interest, all the latest Volvo news, and articles by Members, and a Sales & Wants section. The magazine is produced to a high professional standard by our publisher. To see one of our magazines then click this link. 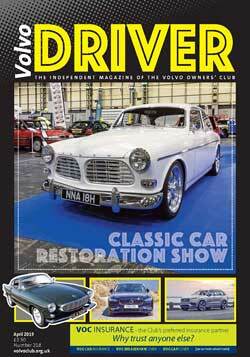 Many of the past issues of Volvo Driver magazines can now be seen on line. These go back to the early 1970's. Although they contain a lot of club information, there is also a lot of information on the progress of Volvo and the cars throughout the years, as well as some technical and interesting general articles. NOTE: These documents are password protected and only accessible by current members of the VOC. Go to Volvo Driver Archives. Selection of articles of interest from previous issues. High Performance Driving. - Learning how to handle an 850 T5. The Saint's Volvos - Article about the TV character 'The Saint' and the Volvos used, and the new series.